My name is SFI, and I blog at Six Figure Investor. I want to share the best investment advice and other investing tips I received in my youth that was staring at me in plain view. It is my hope that the readers of The College Investor will find it useful and entertaining! Let’s go back to the eighties, during the time before anyone realized how over the top that big hair really was. Or, when key-tar players (keyboard on a guitar chassis) were just as cool as guitar players. I was a teenager back then, going to High School in New Jersey. I had aspirations for college, though, my parents were not college educated. My mother finished High School, my father did not. My mother had not developed a career path, though, she did previously work for AT&T in a operator job that paid quite well. She gave that job up after having children, but later returned to the workforce taking a string of low paying jobs. She never did find a job that paid as well as the AT&T position, but one large mass market retailer she worked for had better pay and benefits then the competitors. During this time, the Walmart’s and Home Depot’s were still small compared to their size today, though their businesses were gaining traction. Mobil Corporation (before it merged with Exxon in 1998 to become ExxonMobil of today) entered into the retailing business with its Jefferson Ward stores. What were they thinking? Actually at the time, Mobil was looking for ways to diversify away from energy because the politics were horrible for energy companies. The job my mother got was working in their warehouse operations. Though the pay and benefits were decent, they were less than $8/hour (she never earned more than $10/hour during this period – keep in mind at this time the minimum wage was $3.35/hour). This job did not last forever, about 7 years, then the retailer went out of business. 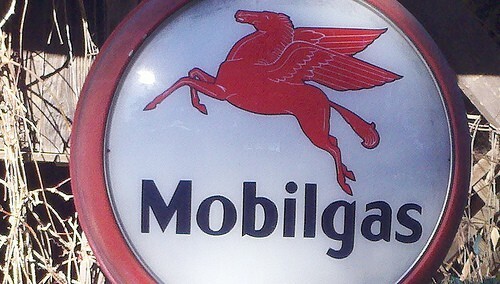 Mobil’s diversion into retailing ended. After she left, she had some shares of Mobil that she had accumulated through the company purchase plan. It was not very many. The Mobil stock price traded around $60/share, it took many weeks of payroll deductions to accumulate just one share. My uncle, who had been invested in stocks for over 20 years laughed when she told him that her account had one share (he said something like, “What are you going to do with one share?”). My mother’s co-workers also enrolled in the purchase plan, but she said that many of them cashed them in upon leaving the job. The amount of money she had in the account was less than $500, but in the 1980’s that was a lot of money to our family. She decided that oil was good business to be in so she left the money in the account. After over 25 years of reinvestment her account has grown to 400 shares, worth over $30,000! I tell this story because there is a lot of hidden advice in it. My mother was not a sophisticated investor, she never wrote or formalized this story as advice. But she employed many of the techniques that successful investors use. In the 1980’s Mobil was a large well known company; it did not require much effort to find it. It had a long track record of earnings, decades of paying dividends, and a large group of shareholders. It was an actively traded stock on the “big board” (NYSE) and would have been found in financial section of daily newspapers. It is unlikely my mother would have invested in Mobil if it was not offered where she worked, but if she had tried to find an investment, Mobil likely might have been one she would have picked. Over the whole time frame she was invested, never once did she consider selling based upon the news of the day, the state of the economy, or pundit analysis about the company or industry, or even for her personal financial situation. There were quite a few major events over time, to put it lightly. The worst probably was the 1987 stock market crash, where Mobil lost 30% of its value in one week. What did my mother do? Nothing. Did Mobil change as a business in one week, or was it expected to change in the future? Did anything change regarding the existing or future need for Mobil’s products? Did anything change with the stewardship or management of Mobil to the detriment of shareholders? If none of these questions were answered with a ‘Yes’, why should you sell? Quick, what is the most important criteria for investment selection? Is it: market share, moat, earnings growth, business sector, profit margin, longevity, or something else? While each of these are important, I would give the largest weight to how well the management of company looks out for shareholders. If the company is not advancing the business for your benefit, the other criteria are will not matter. Mobil could be criticized for venturing off into general retailing, which ultimately did not succeed. However, over the long term Mobil has successfully grown and profited in its industry, under widely varying market conditions for its products. And most importantly, the shareholders have shared these profits. Once my mother started investing she put it on autopilot. Every pay week she added additional money to the account. All the dividends were always reinvested every quarter to buy additional shares. Investors can start with small amounts of money, you don’t need big bucks. As my mother’s experience shows, even a small amount of money can snowball over time. At first it may seem counter-intuitive, but the best long term investments are companies that reliably share their profits with shareholders. There has been research on this topic that has concluded that dividend paying companies provide a higher overall return compared to companies that don’t pay a dividend. This allows your earnings to snowball over time. As my mother demonstrated it only takes one share to get started. Take the time to put some money away in great companies, read The College Students Guide To Investing that talks about how to invest. Readers, what is the best investment advice you’ve ever received? I often saw this same type of story with clients when I worked for a broker-dealer. It’s the consistent buy and hold strategy that when paired with patience can really help you get over the minor bumps in the market. I swear they seem big when you look at the movements now, but 10 years from now they will just be a blip on the radar. Great story and very true! I bought a a little known biotech company when they started and went on to earn a lot from it. It was Amgen! Nice play! That was a risky bet at the start, but it worked out well! My parents had a small restaurant near Amgen in the late 80s and their employee kept telling my parents to buy the stock. Unfortunately, at the time my parents didn’t know anything about stock investing. Opportunity missed…. Cool story! This reminds me of those older investors who got in early and rode their shares all the way up like Walmart and Berkshire Hathaway. With all this volatility today, can we still apply this technique? The days of 10-20 year old bull runs look long gone. They are always companies out there quietly creating value. Performed very well. UTX is a DJIA stock! I think you can. There are a lot of companies now that are in a slump, will reinvent, and be stronger going forward. You can also be risky like KrantCents, and bet on a startup, and enjoy the ride! Buck, I think you’re right. Computer trading causes major swings in the market, so it’s all to easy to be washed out. If you look at his story, it was in the right time, right place (a secular bull). But what happens if we’re in a secular bear. It could be a decade or two of zero returns. Love these types of stories. Proof you don’t need to be a Wall Street pro to be a great successful investor. Great lesson. Some basic investing lessons that all should follow, but often forget. Great story, and invaluable lessons. You also posted good questions to consider, whether or not you should sell. With all that, it’s still really difficult to feel that one wouldn’t be taking a big risk today. Very good points to consider, especially for those who are like me – not active investors but would like to be one day! good article , i think the most eficient advice would be start investing and stay envesting ! i get so scared to lose everything so am always thinking of selling , i dont know why ..